My new guilty pleasure is Fox’s “Glee.” I love it, but because the content is not typically aligned with my convictions, I feel guilty about liking it. Though I’m not crazy about all the moral/ethical leanings of the show, I think there is something there to learn from “Glee” – and that’s what I like. Interestingly, I’m not alone. Lots of other people seem to like “Glee” as well. If you’re not familiar with the storyline, let me give you a quick run-down. “Glee’s” main character is a Spanish teacher named, Will Schuester. Will, looking to regain some of the meaning and past glory of his own teen years at the high school where he now teaches, restarts the once popular glee club, of which he was once a member. In Will’s day, the glee club was cool (which is hard to believe), but as of late has fallen on hard times (this is no doubt a small comment on school’s cutting back fine arts programs across the country). Will’s desire is to bring hope and music to some students, and perhaps find some of his lost self at the same time. In forming the glee club, Will assembles a hodge-podge of misfits and outcasts There’s Rachel, the drama queen born with the belief she will be a star; Kurt, Mercedes, and others, including the wheel-chair bound, Artie who all form their own island of misfit toys. They are all talented, all disenfranchised, all on the outside of the mainstream looking in. Interestingly, “Glee” reminds us that everyone, in some way, is on the outside looking in. As the story progresses, Will discovers, Finn Hudson, the quarterback of the hapless football team, is also a gifted singer and recruits Finn to join the group. In time, other students join the glee club; including Finn’s girlfriend, and head cheerleader, Quinn – who is there mainly to spy for the conniving cheerleading coach, Sue Sylvester (wonderfully played by one of my favorite actresses, Jane Lynch) – and one of Finn’s football friends, Puck, joins the group as well. Not to ruin the story, but every character in this story, from the kids in the glee club to Principal Figgins to Will and his wife, Terri, are profoundly lonely. Each one is groping for their place in the world and something larger of which to be a part. Glee’s characters are searching for some one or some thing that will bring purpose, meaning and direction to their lives: a baby, a trophy, stardom, a marriage, a chance to break out of their small town, and even the acceptance of a parent. How hard it must be for kids who love to sing and dance to be forced to do it alone. Ultimately “Glee” is about longing to be loved for who we are, which is why, I think, the writers and producers chose such extreme characters. In their longing to be “with” others, we are allowed to lower our guards and find some of ourselves within them. And that’s why so many people sing and dance with glee! As I’ve preached through the book of Acts this fall, I’ve been stunned by how all-inclusive and all-embracing is the community of the cross. As Glee illustrates, there are precious few places where someone can find his or her self or discover their place without ridicule or exclusion. That’s why the church of Jesus is special. If nothing else, the church is meant by God to be a place where all that call on the name of the Lord DO fit; where all are invited and there is the constant extension of welcome. I long for a day when a show like Glee isn’t popular. Unpopular not because the singing and dancing are poor, but rather because no one knows what it’s like to be left out, to be alone, to exist without a community and longing. Until then, though, may we create spaces and places where no one sings alone. This is my review of Matthew Raley’s “The Diversity Culture,” which was posted at Viral Bloggers. I picked up Matthew Raley’s. “The Diversity Culture” with great anticipation. Raley is a pastor in my new neck-of-the-woods, dealing with the same social, cultural and spiritual challenges that I have, and the topic – Christian engagement with others – had lots of promise. Plus, it ‘s been a busy month, and if I were to review a book this month, I wanted it to be short, which “The Diversity Culture” is. The information I received regarding the author, projected him as a political and social conservative and the church is woefully short of these kind of men and woman who are engaged in meaningful dialogue with the irreducible Other – or at least are willing to write about it! After giving Raley a solid read, I must confess I found his work to be a mixed bag. That’s not to say that “The Diversity Culture” is a poorly written or overflowing with poor ideas. Rather, Raley and I, while sharing a desire for similar outcomes, we come at interaction with the Other in some significantly different ways. My task here is not to argue with Raley – that would be counterproductive, not to mention out-of-school. Raley has some significantly useful points and perspectives that more Christ-followers would be wise to incorporate. Therefore, I will simple lay out what I consider to be the good, the bad and the ugly and allow you to decide. Raley’s best work surrounds his ability to give Christians a language and process for engaging the Other. This, I know, can be discombobulating to some, especially those that view increasing diversity in America as some kind of threat. Describing the stereotypical World War II man, Raley explains that he “knows who he is.” This kind of knowing is often – and I may be reaching here myself – unsettled by cultures and epistemologies that the World War II man doesn’t understand. If that is the case, then Raley is a great place to begin. What’s more, Raley, gives a step-by-step guide to engagement – the perfect solution for those who don’t quite know what to do. Raley offers scripture, community, and testimony as a way forward. For some this will be a great challenge and Raley gives them glimmers of hope and thoughtful ways to engage. If you know someone who wants to interact with Others, yet is too uncomfortable to do so, then Raley is a good place to start. 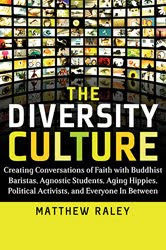 But what Raley does well is also the Achilles heal of “The Diversity Culture.” Admittedly, most of these critiques involve the first half of the book, which was difficult to get through. First, while reading “The Diversity Culture” I got the distinct sense that the Other is a problem to be dealt with, not a person to be loved. The books aim seems to be this: “How do we get the irreducible Other to think and act like typical American evangelical Christians?” This fact is embedded in the book’s title. The subtle suggestion is that there is a “diversity culture” that we need to learn to reach and teach – as if (1) we are not all a part, in some degree, of the same culture and (2) that other cultures out to acquiesce to “our” culture. Raley’s bias is exposed in his exegesis of the Samaritan woman, whom he constructs as the necessary Other to be engaged. Looking at Jesus’ interaction with the woman, Raley offers their interaction with one another as a model for the church. Here’s the problem with that model: (1) Within this interaction, Jesus is socially and politically the superior. This necessarily effects the engagement. We must ask whether or not this kind of engagement is a proper equivalent. Do we want to use an image of superiority when engaging the other? Perhaps one of Jesus’ encounters with a social equal might be better. As Raley writes, you get hints of this superiority in his descriptions of others, such as a New York Times reader or the lady at Café Siddhartha. Raley characterizations may come off to some as flippant stereotypes that may make some readers wonder whether or not he took the irreducible Other seriously as a person. Along with this, Raley offers a popular exegesis of the Samaritan woman that simply is extra-textual. Like many before him, Raley posits that the woman was divorced by her five previous husbands, which may be true but is not actually in the text. How might the reader engage the Samaritan woman if through the devastating blows which life sometimes deals, they discover that she is a five-time widow? Sounds extreme? Maybe. But it is no more or less explicit in the text than a five-time divorcee. Oddly, I happen to know a woman who is a three-time widow. Given the disparity in ages, which occurred in the marriages of antiquity, it’s not entirely far-fetched. Perhaps Jesus’ interaction with the woman is less concerned about sin and more with compassion – but now I’m rambling. At root, however, for Raley the Other seems to be less a person and more the object of a ministry designed less to convert from darkness to light and more to assimilate. But, (and I mean this sincerely) I may be woefully misreading him. Second, because Raley switches back-and-forth between an imagined scene in a café, his own insights and Jesus’ encounter with the Samaritan woman, his writing style seems herky-jerky, at times. Though not a major problem, there are points in which his argument is lost in transition. It should be noted that Raley’s instincts get better as the book wears on, but it’s hard to give him an audience for that long. As a pastor desirous of conveying the message of the gospel, I respect Raley, and his desire to engage the Other in meaningful way. For that we can all be thankful. What makes good preaching? Do you have any idea? I don’t know that I do. I was trained by some of the absolute best homileticians anywhere, who, in turn were trained be great homileticians, so I have a very specific — and, in some ways, theologically acedemic — view of the preaching event. I have a high view of preaching. I know what it is “supposed” to be. At root, I do homiletics. It’s who I am! Which is the case for many other pastors I know. The problem is that for every preacher that has been “trained” in homiletics, there is an entire congregation who is not. This gives rise to the fact that for every face in a worship gathering their is an opinion about what the preaching should and shouldn’t be. Some folks think a good sermon produces something they didn’t know before — but that’s turns preaching into novelty. Others think that a good sermon is “practical” — by which they typically mean “moralistic, therapeutic, Deism.” Yet some want great oratory, the quick turn of a phrase, the sermon turned literary piece, I suppose. And still others want “points” — a form of teaching the Bible simple does not embrace. I’ve known church members who loved the preaching because it was “biblical,” disregading how poorly crafted it was. And others who loved the craft and didn’t notice that the preacher didn’t really say anything.